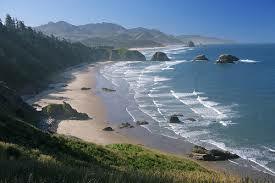 Wow, 360-plus miles of those famous Oregon beaches are set to become smokefree. The state earlier this year banned smoking in its state parks, and it considering adding state beaches to that ban (Almost all of Oregon’s beaches are open and free to the public). If people are caught smoking on a beach, they could face a whopping $110 fine. Smoking bans on beaches drives the smokers rights’ crowd, but there is a logic behind it. Sure, you’re not going to get lung cancer because you’re in the general vicinity of smoke guy smoking on the beach, but anyone who has been involved in beach cleanups will tell you, the No. 1 trash item found on beaches during beach cleanups is cigarette butts. 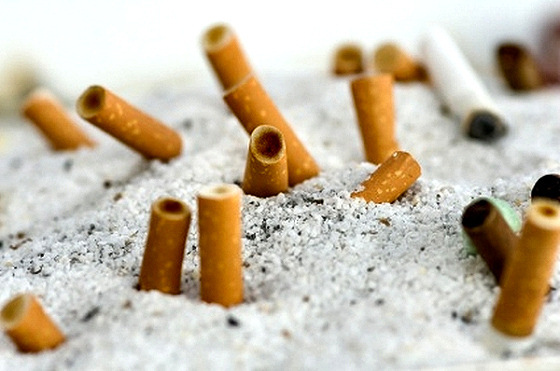 Simply put, there’s no ashtrays out on the beach, so too many smokers end up using the sand as an ashtray. More than 1/3 of the waste cleaned up beaches every year is cigarette butts. So, looking at that, honestly, it’s impossible for me to feel sorry for smokers who are told they can’t smoke on beaches anymore. Sorry, too many smokers blow it. Even if you’re not one of the bad guys, too many blew it for all of you. The height of the smoking epidemic was 1965, when 42 percent of the population of the U.S. smoked, and the daily average of cigarettes smoked was 11.7. The biggest spike in the smoking rate happened after WW II, and I’ve actually heard a logical reason for this. Millions of guys went overseas to war and a lot of them smoked; they were actually given cigarettes in their K-rations. Why? Well, because they all figured they were going to die anyways, so why not smoke? When they came back from war, they were hooked. 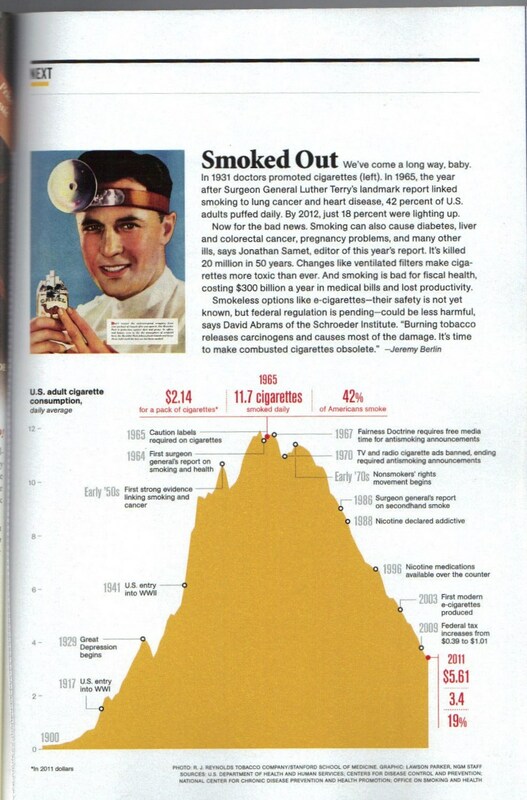 When the smoking rate started to finally decline was the early 70s, National Geographic identifies this as “the beginning of the nonsmokers rights’ movement.” In 1986, came the Surgeon General’s report on secondhand smoke and in 1988, came the SG report on the addictiveness of nicotine. (Surprisingly, this graphic doesn’t include the 1998 Master Settlement Agreement, which killed Joe Camel, and I think was a fairly major landmark in the battle against smoking and the tobacco industry). 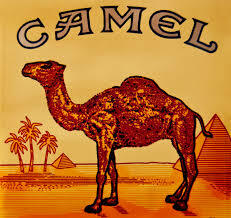 By, 2011, the smoking rate had declined to 3.4 cigarettes a day per capita, with 19 percent of the population smoking. One thing I found interesting about this graphic was seeing how the smoking rate today is roughly equal to what it was around 1930. Interesting story from Epoch Times. 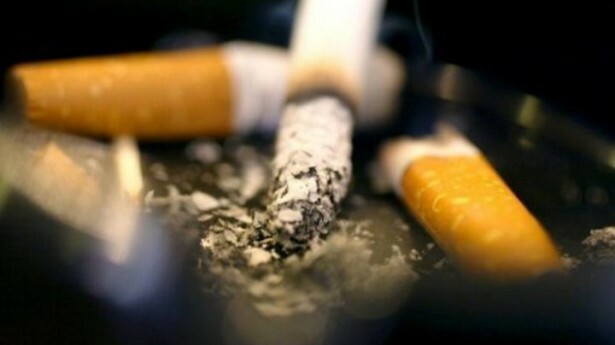 According to a Washington University study, smoking may actually contribute to the risk of suicide. And that policies that work to reduce smoking rates such as cigarette taxes and smoking bans might also reduce the number of suicides. I know that sounds nuts, but there seems to be some basis for this conclusion. First, it’s been well-established that people with diagnosed mental illnesses — bipolar disorder and schizophrenia — smoke at a higher rate than the general population. That’s a given. Now, it may be that nicotine or other drugs in cigarettes are making mental health worse (considering just the pure addictive nature of nicotine, I can believe that easily.). New research at Washington University School of Medicine in St. Louis finds that smoking itself may increase suicide risk and that policies to limit smoking reduce suicide rates. In a study published online July 16 in the journal Nicotine & Tobacco Research, a team led by Richard A. Grucza, PhD, reports that suicide rates declined up to 15 percent, relative to the national average, in states that implemented higher taxes on cigarettes and stricter policies to limit smoking in public places. Although scientists have known for years that people who smoke have a higher risk for suicide, they had assumed the risk was related to the psychiatric disorders that affect many smokers. 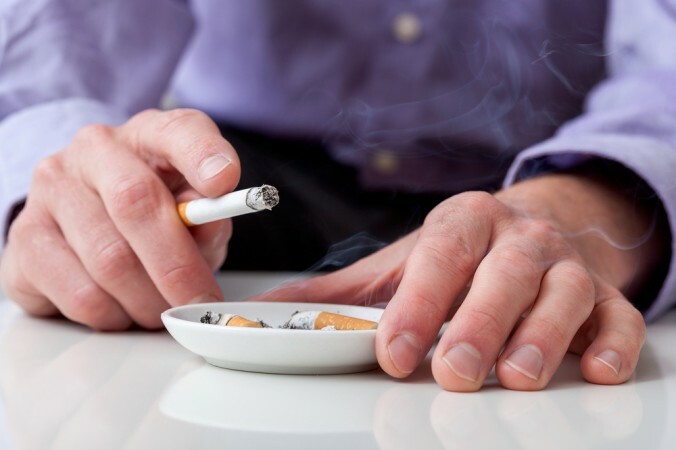 These new findings, however, suggest smoking may increase the risk for psychiatric disorders, or make them more severe, which, in turn, can influence suicide risk. Grucza suspects nicotine may be an important influence on suicide risk. Based on the study’s results, he said he is concerned that many new restrictions on public smoking don’t cover newer e-cigarettes, which deliver nicotine but release vapor rather than smoke. This mechanism purportedly allows those addicted to nicotine to get a “fix” without affecting the air others breathe. So, it’s possible that nicotine or other chemicals in cigarettes are making bipolar, depression or schizophrenia worse (Remember, it’s become well-established in the last few years that smoking absolutely, positively does make arthritis and diabetes worse). Interesting and important study. Again, a lot of hidden damage gets done by cigarettes and smoking — not just lung cancer. billion in punitive damages against RJ Reynolds in one of the thousands of Engle cases in Florida. I said that dollar amount would likely never hold up on appeal. Well, sure enough, some legal experts have weighed in, saying it can’t possibly hold up, but it may not matter, because it might signal future huge punitive damages against RJR. “Nobody thinks the $23 billion is going to remain,” said Richard Daynard, a law professor at Northeastern University and the chair of its Tobacco Products Liability Project. Because of constitutional guarantees of due process, the Supreme Court has shown a reluctance to allow punitive damages that are far out of line with compensatory damages in the same case, he said. The court’s general guideline is that the ratio of punitive to compensatory damages should be below 10:1. However, the compensatory damages in the case were roughly $16 million, which means, Daynard says, there could still be punitive damages up to $150 million. “I worked with juries for several decades, and I cannot put my mind on what they are doing, but the Florida jury (in awarding a huge sum) seems to be sending a message,” said Duke’s Vidmar. “This is a statement from the jury that this was an outrageous behavior by the tobacco companies. One thing I saw in this article, and something I have wondered about, is how much the tobacco industry has actually paid out in the Engle cases. The original class-action award was $145 billion, which was overturned by the Florida Supreme Court 8 years ago. Since then, RJ Reynolds has paid out $114 million in 15 resolved cases. Another $180 million in damages are held up on appeal. I also mentioned this in my my earlier post. These huge damages I think — eventually — will force RJ Reynolds to simply settle with the remaining defendants. Obviously $23.6 billion isn’t going to happen, but constant, never-ending $20 million here and $20 million there is going eat away at RJ. Might be better to just settle and get rid of the legal uncertainty. “You’re going to have a lot more cases where juries could find themselves similarly outraged,” he said. “The reluctance of the tobacco companies to settle these cases, thinking they can handle the cases as a matter of course, may be a mistake,” Daynard said. Wow, this is a big “wow.” A big wow that will likely get reduced upon appeal. In one of the thousands of Engle liability cases in Florida, a jury awarded a settlement of $23.6 billion (yeah, billion) in favor of one of the 8,000 Engle plaintiffs. (The Engle decision was a Florida Supreme Court decision in 2006 overturning a $145 billion class action decision against Big Tobacco in favour of the plaintiffs. While the court upheld many of the merits of the case, it threw out the class action part of a lower court decision, meaning those 8,000 plaintiffs all have to sue individually. So thousands of lawsuits in Florida have moved forward. This is by far the biggest jury judgement against R.J. Reynolds. The jury awarded $15 million in compensatory damages and $23.6 billion in punitive damages (to punish R.J. Reynolds for lying and covering up the true dangers of their product and the addictive nature of nicotine.). That’s one case … versus $145 billion for 8,000 plaintiffs. Unfortunately, that punitive damage amount is so outrageous, I can’t imagine it will stand up to appeal. As much as I think it sends a message to the tobacco industry from the jury that “Wow, we really think you lied your asses off,” I don’t think it necessarily does a lot of good to make judgements so huge that they can’t possibly hold up. The tobacco industry has not been successful lately, especially in Florida, in winning these Engle cases, but they have been successful in dragging out appeals indefinitely. An appeal will be automatic in this case over such a large sum of money. Anyway, there are literally hundreds more of these cases in Florida, and the tobacco industry has been consistently losing them, which is ultimately a good thing. I think ultimately, all these judgements will force RJ and Philip Morris to eventually settle with the thousands of Engle plaintiffs for an amount that for the tobacco industry will still be the “cost of doing business.” Because, I figure even the tobacco industry has to get sick of constantly being in court all the time and constantly dealing with legal fees. Last week, Kevin Millar, former “Cowboy Up” Red Sox and one of the more entertaining voices on the MLB Network, appeared on Dan Patrick’s radio show on ESPN Radio, and Dan Patrick specifically asked him a number of questions about chewing tobacco in light of Tony Gwynn’s recent death from cancer. To recap, Tony Gwynn died of salivary gland cancer, which appeared in the same cheek as where he always chewed. Baseball is being pressured to ban chewing tobacco on the field. The MLB actually wants to do it, but the players’ union is resisting. Chewing tobacco is already banned on the field at the minor league level and by the NCAA. For some bizarre reason, chew is deeply ingrained in the culture of baseball. A culture that is proving difficult to break. Millar gave a really honest, articulate and poignant interview, not mincing words about how stupid chewing tobacco is and how he badly wants to quit. Here are a few snippets from the interview. Miller on how he always chewed when he went out on the baseball field, and now still has the habit of chewing when he goes out to golf. Millar said he didn’t start chewing until 1996 when he was given his first can of Copenhagen by former big league pitcher Pascual Perez. Patrick brought up the point that some people have claimed that chewing tobacco is a Performance Enhancement Drug (apparently because you get a charge of energy from the nicotine?). Patrick pointed out that perhaps baseball could ban chew on these grounds. Millar disagreed. ” It’s an addiction. It’s a choice. It’s a bad choice. I don’t that it’s a performance enhance. It’s just a bad choice,” he said. Patrick made his own poignant comment of why did it take Tony Gwynn’s death to get so many ballplayers thinking about chew? “We know it’s stupid every time you stick your finger in there and grab a pinch,” Millar responded. He suggested one reason more players don’t think about it is because they think that what happened to Gwynn could never happen to them. “You think ‘it’s not going to happen to me, right. It’s not going to happen to me’ I used to watch Johnny Pesky at 83 years old with a full chew in …. he passed away at 92, 94, he did it for 60 years. At the end of the day, you’re playing Russian roulette,” he said. “But when it hits home, it makes you think. I have four little kids. 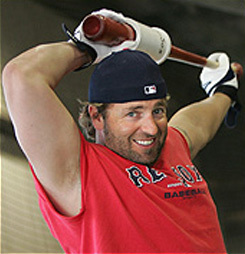 I want to be around,” Millar concluded. 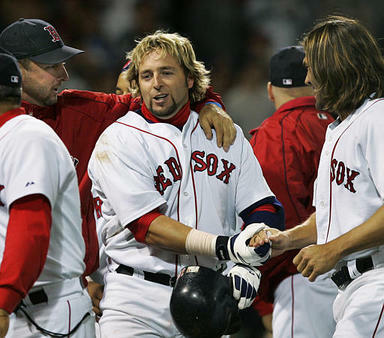 Good luck to Kevin Millar in quitting chew.